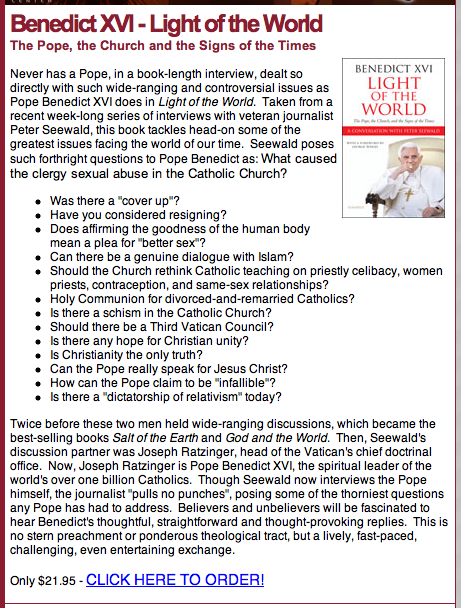 Pope’s New Interview in a New Book!! Click image for more info or to order. Hi Bro. Steve, blessed day to you! I’m a Filipina working in Dubai. I’ve attended your teachings last Feb. 3-5 of 2010, and looking forward to seeing you again this coming 29th of Nov.
Pope Benedict XVI? If you can it will be very much appreciated and awaited. May God continue to empower you and your family as He blesses your plans & endeavors. May all we say, do & think be all for the glory of God. Family of Faith Foundation will be bringing many books, but not the Pope’s. you can get that at the Dubai bookstore. See you soon.